The generic HP 9000/715 name actually covers two distinct workstation designs, which share the same case, on-board devices, and expansion capabilities. The first generation was introduced in 1992 and was built upon the existing workstation chips (ASP, VIPER, WAX) pioneered by models 720, 730 and 735. They are models 715/33, 715/50 and 715/75. A few years later, after the launch of the successful compact 712 workstation with the new LASI chip, the second generation was built reusing the 715 case with the 712 design. They are models 715/64, 715/80, 715/100 and 715/100/XC. This machine comes in a small pizzabox case. It is quite unique in the workstation ecosystem in that the top of the case can't get removed, but instead rotates to expose the internals. Unfortunately, the lock mechanism doesn't age well and gets prone to jam (preferrably in the open position, which is a relief). The chassis has room for three internal storage devices, two 3"1/2 devices and a 5"1/4 device with front bezel access (either a tape or CD-ROM drive). 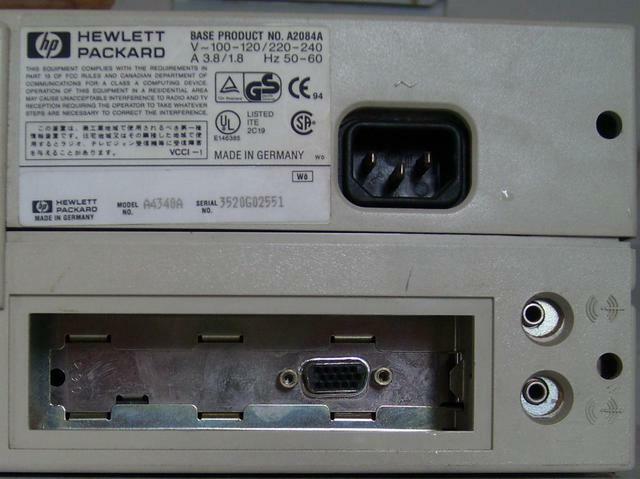 An interesting design tidbit is that the headphone and microphone audio connectors are found at the front of the machine, which made sense for a machine intended to be a workstation, yet was quite uncommon in the 90's. All the other I/O connectors are found on the back of the machine. 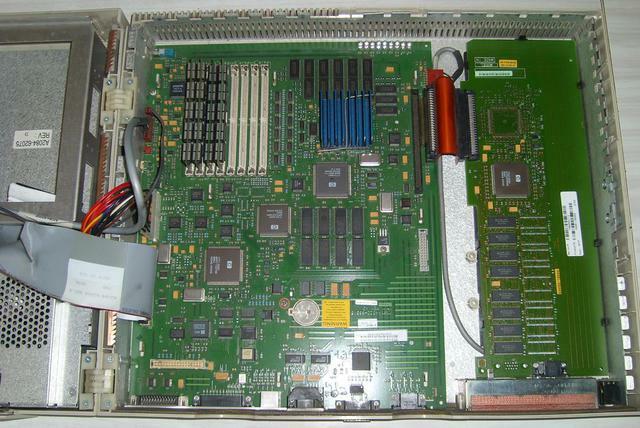 The line-in and line-out audio connectors are found on the rightmost side of the chassis, with the expansion slot, which can host either an HP-specific GSC expansion board in EISA form factor, or any EISA board using the EISA adapter board (whether the chassis was to be used with GSC or EISA boards had to be decided at machine order time). 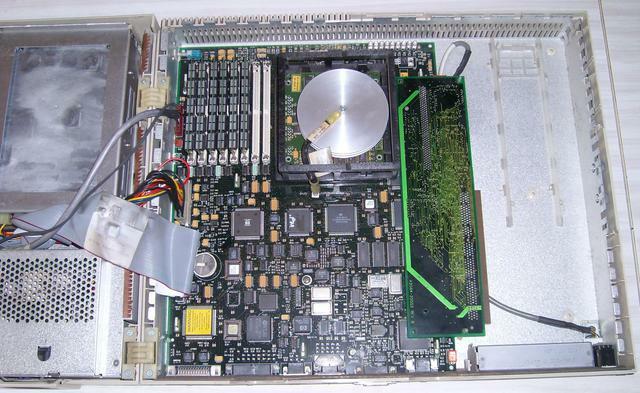 As mentioned above, the top of the chassis can't get removed, but instead rotates to expose both the upper part of the chassis, sporting the disks, and the lower part, sporting the motherboard and the optional expansion board. This rotating design makes the 715 chassis a major annoyance to service, because it requires twice as much room as any other pizzabox-like workstation to open. Also, the upper part weighting much more than the lower part (if only due to the power supply), folding a 715 chassis back to its normal form can be a tedious task! Here is an inside view of a 715/100/XC system. The motherboard spans the leftmost two thirds of the available space, the remaining third being used by an expansion board; in this particular case, a GSC graphics board. Here is an inside view of a 715/75 system. 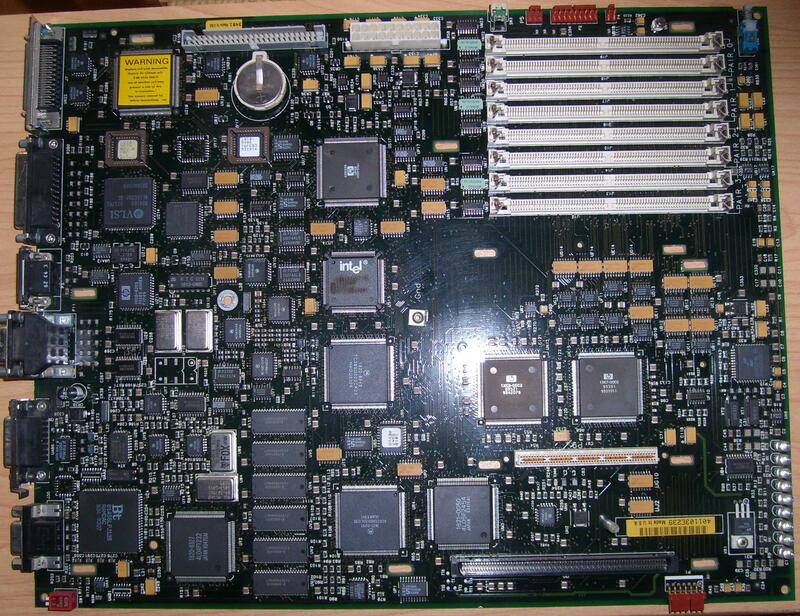 The motherboard is quite different from the 100/XC one, and there is no expansion board, but an EISA adaptor board is present. Despite the enclosure being made of plastic, inside it is covered in metal. Therefore the motherboard needs to be insulated from the chassis. 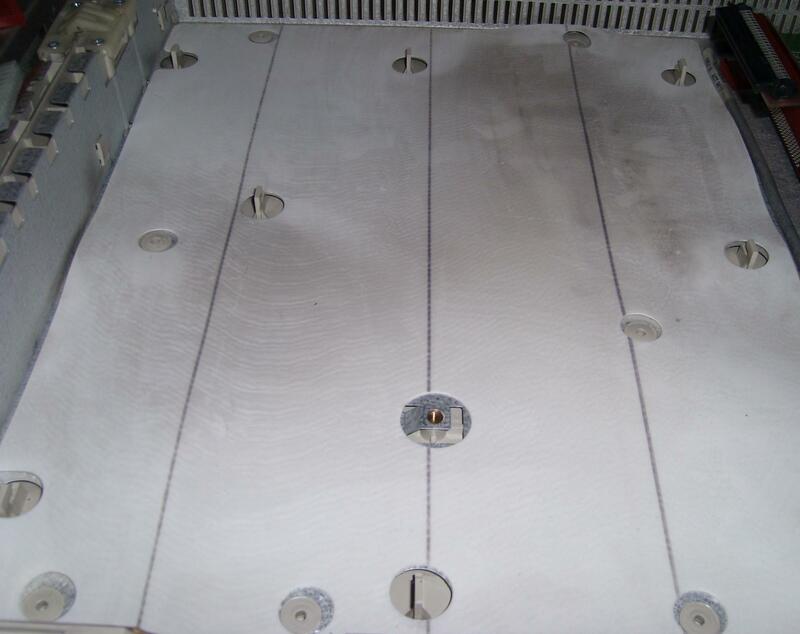 It is thus no surprise to find an insulating layer under the motherboard. 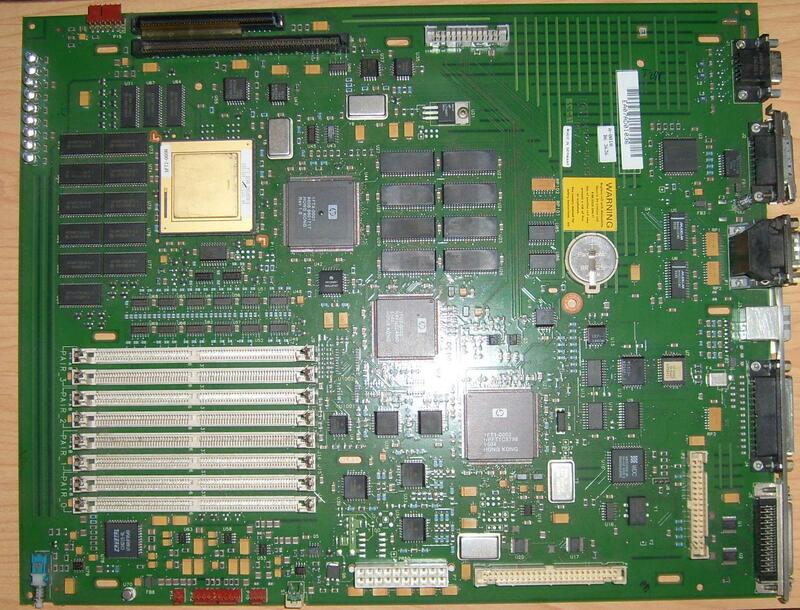 Here is a better view of the 715/100/XC motherboard, without memory and the processor heatsink. 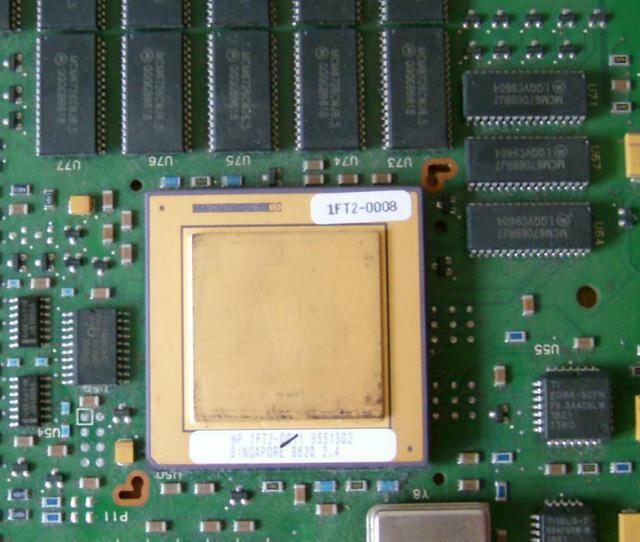 A closer look at the naked PA-7100LC processor, and above it, part of the 1MB external cache. Here is a better view of the 715/75 motherboard, without memory and the processor daughterboard. 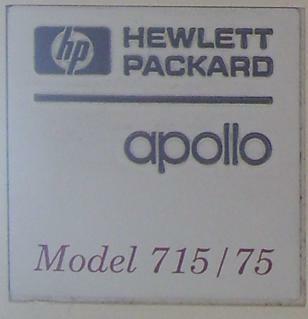 Note that I used to own a 715/33 system, which uses the same components as model 715/75, and it had a soldered-on CPU, similar to the 715/100/XC motherboard above. I don't know what the 715/50 motherboard looks like, but the 715/75 motherboard might have been designed with a processor upgrade in mind - which, to the best of my knowledge, never occured. Here is what the bottom side of the PA-7100 processor looks like. The heatsink seems to be glued to the processor, and I will not dare touching it, so I can't show you the front of the processor chip. Please enjoy this sideways view. Here is a better look at the EISA adapter. 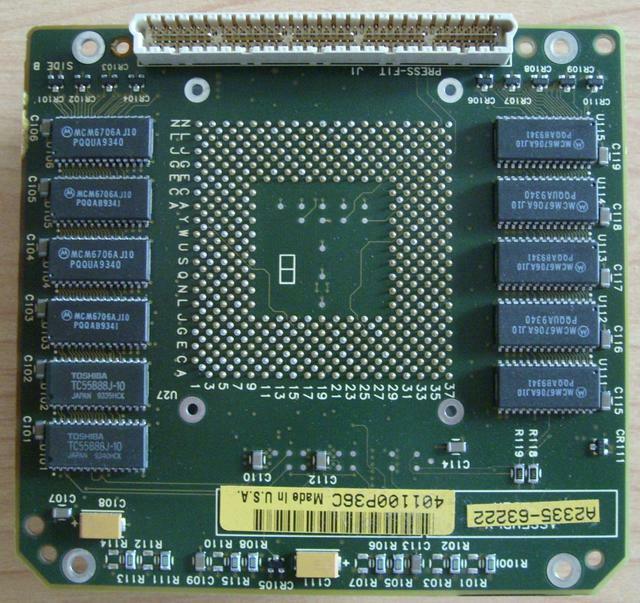 Here is a better look at the GSC frame buffer board. Link to the museum page for this machine. 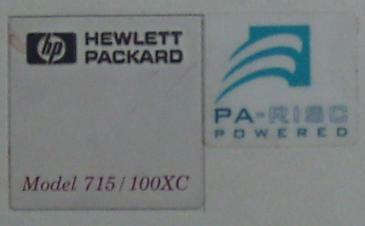 The OpenPA site has detailed information about HP PA-RISC based workstations, including HP 9000/715 systems. OpenBSD runs nicely on all 715 models. All on-board devices are supported. There is currently no X server for the frame buffer, though. (notice how the on-board devices are different, with asp instead of lasi, and a different SCSI controller).